I never hold up anything as “good” evidence – there is no such thing as “good” ghost evidence, only “cool” ghost evidence. This is some of that! 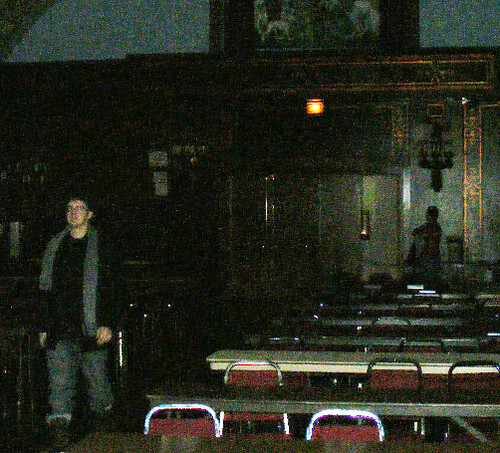 The picture was actually taken without the use of a flash (hence the brightness/contrast adjustment), and most of the rest of the group was on the other side of the ballroom, about to leave. The light source visible is presumably from the doorway. It’s POSSIBLE that someone else was taking a picture at the exact same second, but the silhouette is much better defined than I’d expect from that sort of situation.